※ hello world simple benchmark, see details of blog entry. mod_murby is A Fast and Memory-Efficient Web Server Extension Mechanism Using Scripting Language mruby for Apache httpd. Unified Ruby Code between Apache(mod_mruby), nginx(ngx_mruby) and other Web server software(plan) for Web server extensions. You can implement Apache modules by Ruby on Apache httpd. mod_mruby is to provide an alternative to mod_lua or ngx_mruby of nginx. Supported OS: Linux FreeBSD Windows and so on. # write balancing algorithm here. # for Web server extensions. # mod_mruby => "Hello mod_mruby/0.9.3 world!" 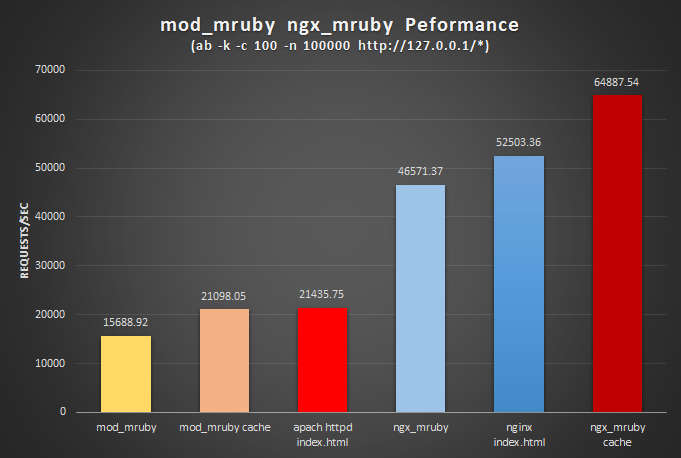 # ngx_mruby => "Hello ngx_mruby/0.0.1 world!" As the increase of large-scale and complex Web services, not only a development of Web applications but also an implementation of Web server extensions is required in many cases. The Web server extensions were mainly implemented in C language because of fast and memory-efficient behavior, but extension methods using scripting language are proposed with consideration of maintainability and productivity. However, if the existing methods primarily intended to enhance not the implementation of Web applications but the implementation of internal processing of the Web server, the problem remains in terms of fast, memory-efficiency and safety. Therefore, we propose a fast and memory-efficient Web server extension mechanism using scripting language. We design the architecture that a server process create the region to save the state of the interpreter at the server process startup, and multiple scripts share the region in order to process fast when the script is called as internal processing from a Web server process. The server process free the global variables table, the exception flag and the byte-code which cause the increase of memory usage mainly, in order to reduce the memory usage and extend safely by preventing interference between each scripts because of sharing the region. We implement the mechanism that can extend the internal processing of Apache easily by Ruby scripts using Apache and embeddable scripting language mruby. It's called "mod_mruby". mod_mruby is maintained by matsumoto-r. This page was generated by GitHub Pages using the Cayman theme by Jason Long.